There has been one constant with Christian Brothers Academy Baseball since April 3, 1974: head coach Marty Kenney. "My senior year in college, the opportunity to teach and coach [baseball] at CBA was offered to me by my high school basketball coach, Vinnie Cox," Kenney said. "I had tremendous respect for Coach Cox as both a person and a basketball coach. I accepted the offer without hesitation." Coach Kenney won his 800th game as CBA Baseball's head coach last Friday, a thrilling 6-5 walk-off victory over Wall Township. 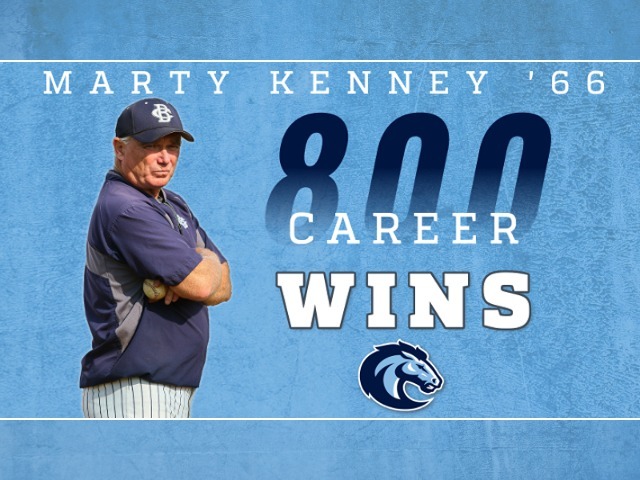 Kenney becomes just the second coach in New Jersey high school baseball history to reach 800 wins, behind Ken Frank of Toms River South. "My initial reaction [to 800 wins] has always been one of satisfaction," Kenney said. "Through the combined efforts of both past and present coaches, players, and parents, the CBA baseball program has achieved a level of success that I always dreamed was possible as a young coach." After CBA had three different head coaches between 1961 and 1973, Kenney's first victory came in a 6-1 win over St. Mary's South Amboy, and he achieved quick success after that. The Colts won the program's first-ever state championship in 1977. Throughout Kenney's tenure as head coach, CBA has won three state championships, eight state sectional championships, eight Monmouth County titles, seven Shore Conference Championships, and 17 divisional titles. His overall winning percentage exceeds .700. "We have created a baseball tradition which has been recognized throughout the state. To me, our success is symbolic of the dedication and strong work ethics of those associated with the program," Kenney said. In 2015, Kenney's Colts completed the heralded "quadruple crown," which includes winning the state, sectional, conference and division championships in the same year. Just a single other team had completed the quadruple crown in Shore Conference history prior to 2015. "It's milestones like this that result in a flood of memories. It makes me realize how privileged and lucky I’ve been over the years," he said. Another special trait from Kenney's career as CBA head man has been the ability to work with his sons. Both Marty Jr. '90 and Chris '94 played for and then returned to coach with Kenney at CBA. Marty Jr. is currently the lead assistant and pitching coach for the Colts. "Each of my sons has had a tremendous impact on the program as both players and coaches," Kenney said. "It is gratifying that they share my passion for the game and for CBA. I am proud that, as adults, they have also chosen to share and encourage their love of the game with others." And while it is never his ultimate goal, Coach Kenney has helped 11 former Colts develop into professional baseball players. Three of them are active in Major League or Minor League Baseball today: Pat Light '09, James Yacabonis '10 and Joe Dudek '13. Nearly 20 former Colts are currently playing college baseball, with half of them playing at the Division I level. After almost 45 years as CBA's head coach, Kenney shows no signs of stopping just yet. "Each team presents a new challenge," Kenney said. "It’s about working with young people and hopefully giving them the tools to help them succeed in life."